Cur-OST SA Total Support uses highly bio-available, patented BCM-95® Curcumin and Boswellia plus antioxidants in a nutritive base to manage inflammation and support gastrointestinal health. Dandelion, Marshmallow and Parsley to support allergy conditions and promote gastrointestinal health. Benefits joint comfort and overall health.. Our most popular allergy and digestive formula for dogs! Cur-OST SA Total Support uses highly bio-available, patented BCM-95® Curcumin and Boswellia plus antioxidants in a nutritive base to manage inflammation and support gastrointestinal health. Dandelion, Marshmallow & Parsley to support allergy conditions and promote gastrointestinal health. Benefits joint comfort and overall health. Cur-OST SA Total Support targets high levels of inflammation and pain while enhancing digestion, helping to improve joints, mobility and improve allergies of all origins. The ideal formula for those dogs that have skin or respiratory allergies characterized with redness of skin, itching, odor or coughing with phlegm production. SOLUTION: Manage the chronic inflammation that is contributing not only to pain and discomfort, but also impacting the immune function and allergy production. 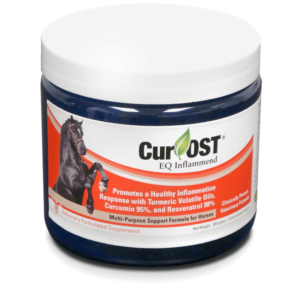 Cur-OST SA Total Support Reduces high levels of inflammation and pain, managing allergies and enhancing digestive health in ONE formula! Target The Inflammation That Is Contributing To Overall Health Deterioration In YOUR Pet! 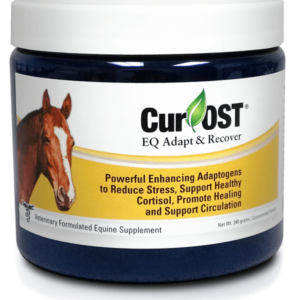 Our Cur-OST SA Total Support supplement provides higher levels of inflammation and pain reduction plus anti-oxidants, vitamins and minerals in their natural forms though the use of nutritive herbs. Uses potent levels of dandelion, marshmallow and parsley extracts to impact digestive health, reduce inflammation, oily discharges and phlegm. 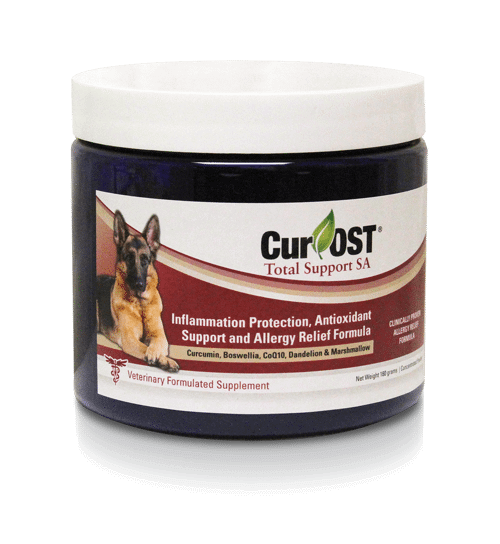 Our Cur-OST SA Total Support formula is ideal for those pets with skin allergies, ear conditions, chronic bacterial infections associated with allergies and persistent yeast infections. The MOST complete supplement for your pet, supporting overall health and digestion, while reducing chronic inflammation, allergies and joint pain! Veterinary Formulated. Research Supported and Clinically Utilized to get Results! 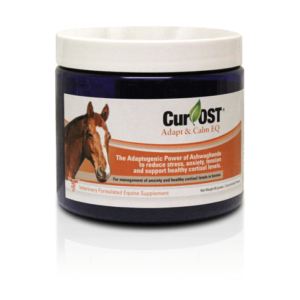 The Cur-OST formula for companion animals is supplied as a powder formula with a light hypoallergenic and gluten-free peanut butter flavor. The product is dosed at ½ tsp per 10 lbs. once to twice daily, which is generally mixed with dry kibble, canned food, yogurt or other food mediums. In most cases, the product is well accepted.